As Roman Catholic cardinals meet to choose the future pontiff, Wabash music professor James Makubuya recalls the blessing Pope John Paul II gave him and his work more than 20 years ago. Makubuya was a student in his early 20s when he traveled to Rome in 1980 as director of the National Choir of Uganda. His 150-member ensemble of singers and instrumentalists offered the first presentation of indigenous African worship music at the Vatican during a Mass at St. Peter’s Basilica celebrated by Pope John Paul II. The pontiff was so moved by the sound of voices in eight-part harmony and African rhythms and instruments that he halted the recessional. 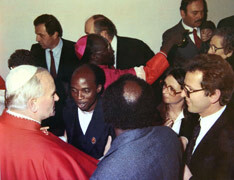 Walking cautiously to where the Pope was standing, Makubuya knelt to kiss the Papal ring. “He said, ‘No, no—you don’t need to do that. I just want to thank you.’ And he gave me a hug. I didn’t know what to say. “God bless you, and God bless your choir,” the Pope told Makubuya. Then he smiled and walked away." As surprised and gratified as their director by the Pope’s affection and appreciation, Makubuya’s choir began to clap while journalists snapped photographs of the moment. It was a high point of Makubuya’s life that almost didn’t happen. The choir’s visit had been sponsored by Ugandan Cardinal Emmanuel Nsubuga, but the day before the were to appear before the Pope, the Vatican’s liturgical director questioned the group’s technical ability. The Basilica’s highly trained choir traditionally sang at Masses celebrated there by the Pope. The Vatican director saw little reason to depart from the tradition. So Cardinal Nsubuga convinced Makubuya to present a preview to the Vatican director. First they sang Western-style worship music to near perfection. The official said he’d heard all he needed to hear. But Makubuya insisted he stay to listen to a rehearsal of the African worship music, as well. “When they finished, this man asked to speak to the choir,” Makubuya recalls. “He stood before them and, in his best English (with an Italian accent), said, 'Tomorrow you shall sing in St. Peter’s Basilica.'" When John Paul died April 2, Makubuya found the photographs others had taken that day at St. Peter’s. 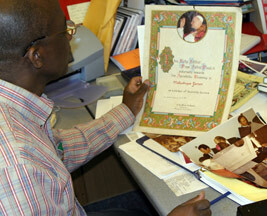 Makubuya recalls a story his sister told him about the Pope’s visit to her village in Uganda in 1993. “He was on his way to celebrate Mass at the site of the Ugandan Martyrs when he saw a lame child,” Makubuya says. “He stopped, asked the mother to bring him the child, then he blessed the boy and hugged him. In Uganda, no one had seen anything like that—such a man stopping to bless a lame child. John Paul’s words to Makubuya proved prophetic—his life and work have been blessed. He is married with four children, and he has started African musical ensembles at UCLA (where he earned his doctorate as an ethnomusicologist), then MIT, and, most recently, at Wabash. Here his Wamidan world music ensemble has performed the same offertory dance and song his National Choir of Uganda once presented to the Pope. “He said, ‘You are going to come back to St. Peter’s Basilica and sing again,’ and I started to interrupt him, to explain that would not be possible. ‘No, he said, you will come back, though maybe I won’t be the Pope. There may be another Pope, then. But you must come back.'"